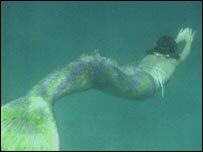 A free diver from Cornwall has been turned into a mermaid for a romantic comedy film starring Kelly Brook. Hannah Stacey, 29, from near Newquay, has donned the prosthetic tail for Fish Tales, a film about a mermaid who falls in love with a university professor. 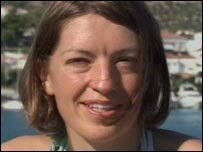 Hannah, who currently holds the UK's free diving woman's record of 54m (177ft), said it was a dream come true. "I'm very excited - I can't wait to see the final film. I feel more like a mermaid than I thought I would." Hannah has spent a total of three weeks in Greece filming her part in the film, which also stars Titantic actor Billy Zane. Director Alki David said she was extraordinary graceful. "She's amazing in the tail, she's like a natural. As soon as she put it on, she just took off. She knew exactly what to do and we couldn't stop her." The tail took three-and-a-half months to build and was moulded to fit Hannah. "Once you get into the water and are cocooned inside this tail, you are a fish and I keep trying to look behind over my shoulder to see my tail flicking," she said. The film, which also stars Billy Zane, is expected to be released next Summer.